Windows Contacts is inbuilt feature of Windows Vista that helps you to maintain your contacts and access them from other Windows programs such as Windows Mail. Using our effective excel to Windows contacts converter program you can easily convert contact saved in excel spread sheet into Windows contacts. Excel to Windows contacts migration program provides facility to export contacts from excel sheet with complete details ( including First Name, Last Name, Job title, Company etc) to Windows contacts. 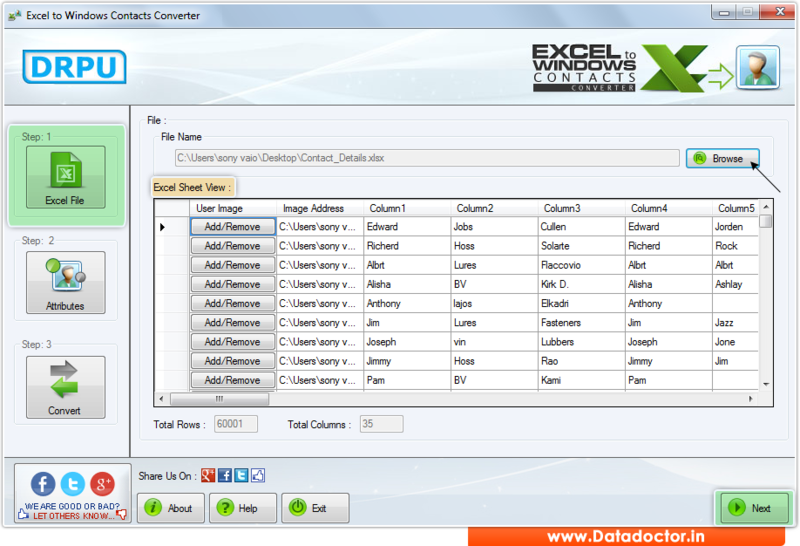 » Excel to Windows contacts migration software converts contacts stored in Excel sheet into Window contacts. » Software converter program works on all latest versions of Microsoft Excel. » Software allows you to export contacts stored in excel to Windows contacts. » Software converts contacts even if Microsoft Office is not installed on your computer system.